Assigning candidate names to AI-controller, combat-ready invertebrates and letting them wage war until only one stands? YouTube’s Many A True Nerd might be onto something. 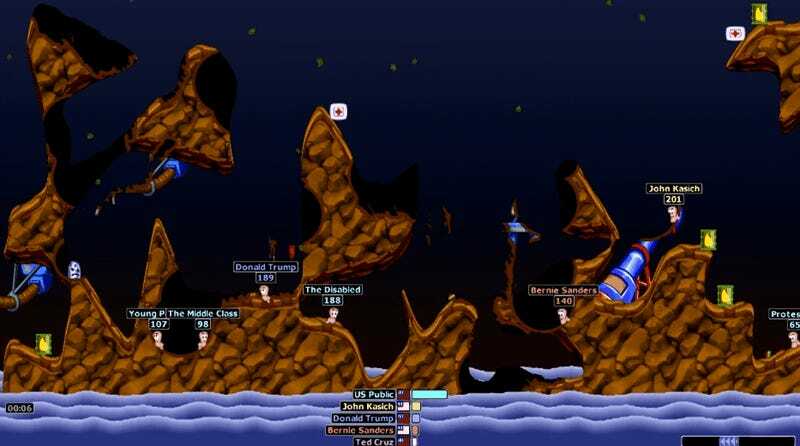 In order to simulate the U.S. presidential race, Jon from Many A True nerd created a custom battle in Team17's 1999 multiplayer battle classic. Worms representing Ted Cruz, Hilary Clinton, Bernie Sanders, Donald Drumpf and John Kasich were assigned a CPU level of four, making them relatively deadly but not frustratingly so. For his own team Jon created eight combatants representing the American people, who would skip their turns, simulating the effect the candidates would have on various social and economic groups. I won’t spoil the outcome just yet, only to say that not a single member of the American people makes it to the end of the race.